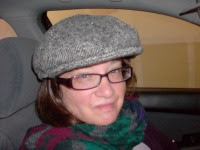 This week's Off The Beaten Track contributor is the Australian journalist, Heather Jacobs. For the past 16 years before joining Ogilvy PR in April as an editorial specialist, Heather Jacobs has been published in a diverse range of publications including The Sydney Morning Herald, The Sun-Herald, IF magazine, Media and Marketing Asia, and New York based photography magazine, PDN. Specialising in writing about advertising, media and marketing, she has held staff positions on Ad News, New York-based TVC production magazine, Shoot, B&T and Campaign Brief Asia and Australia. In 2006 she had a non-fiction book published under the CareerFAQs series, advising students how to get a job in advertising. Passionate about travel she has lived in Japan, London, Vietnam, and New York and travelled throughout Europe, South-East Asia, South America and Mexico – where she had a fake Mexican wedding at a hippy commune. She is currently working on a novel set in India, although she’s still angling to go there for ‘research’ purposes. You can find Heather at her wonderful blog http://ilovebondibutiliveinrosebay.blogspot.com/. “Look upstairs and paddle,” instructs one of the ridiculously good-looking Portuguese surf instructors, both of whom are named Ricardo. I paddle furiously, and I’m up on my bright blue foam board, arms stretched out in the warrior pose before falling headfirst into the whitewash. I lived across the road from Bondi Beach for over a decade but it took a trip to Portugal to get me on a surfboard for the first time. When I first booked into the Algarve Surf & Yoga Retreat – better known as Tipi Valley – in the Western Algarve, the southern most region of Portugal, at the bequest of my friend Selina, a keen surfer from the UK, I was more interested in the yoga. 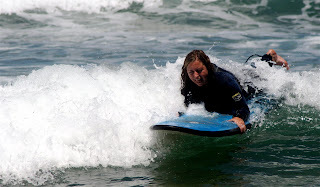 I agreed to give surfing a go, since it was part of the package, and had so much fun that I wish I’d tried it years earlier. The ecologically sustainable company was started by Australian surfer/sailing instructor, Laurie Quirk and built with the help of WWOOFers (Willing Workers on Organic Farms). 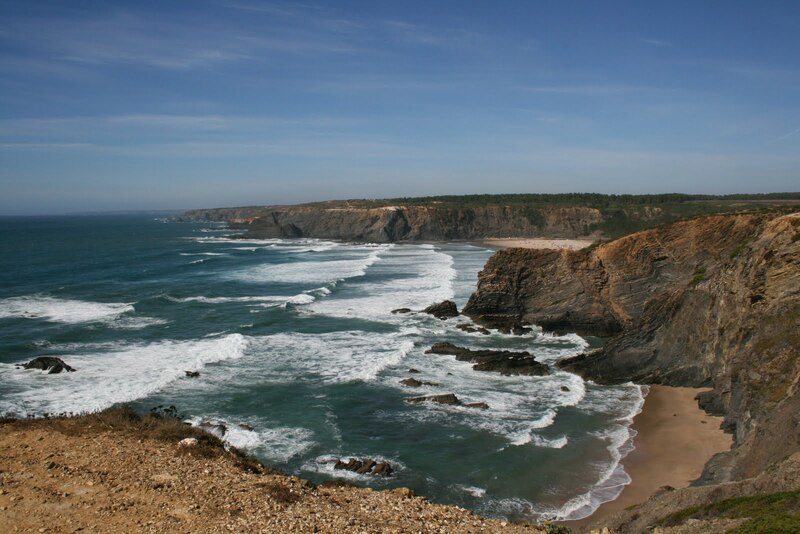 It’s in a stunning valley on the Costa Vicentina Natural Park, the largest protected natural park in Europe, which has 74,000 hectares of rolling hills, cliffs, rocky coves and beaches. While the Algarve has a reputation for being overrun by tourists, the fact that we are a one-hour drive from the nearest international airport, Faro, and the lack of five-star resorts means the area retains its charm. We share the beach, which is framed by volcanic cliffs, with a handful of Portuguese and Spanish families. There is a Tipi onsite. Built from 12-foot eucalyptus poles cut from the property, it sleeps six, has a floating wooden floor and is furnished with single beds, rugs, a lounge, and Moroccan lamps. Selina and I are in the breakaway tent, which has twin beds with pink chenille bedspreads, and mosquito nets. 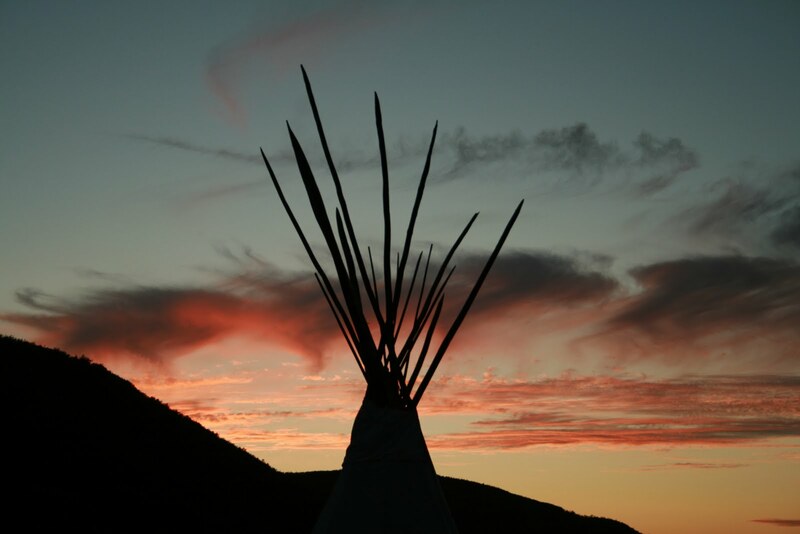 The camp sleeps a maximum of 10 with a smaller Tipi and two canvass tents. There are seven other guests who have come from Ireland, the UK, Portugal, and the United States. We do an hour and a half of yoga each morning before breakfast and then head to the beach for the surf lessons. Our yoga teacher is Cherie, who teaches a Kundalini-based Hatha yoga. The surfing lessons are outsourced to the Odeceixe Surf School (pronounced O-de-shaish), which is run by David who has lived in the area all of his life. Since both our instructors are called Ricardo, David tells us we can call one Ricardo uno (one) and the other Ricardo dos (two). The first is a former body-boarding champion for Portugal and the second is a lifeguard and volunteer fireman. A couple of hours in the surf has us feeling ravenous. Lunch is at a café overlooking the beach where we have fresh seafood, Portuguese custard tarts (pastel de natas) and glasses of Vinho Verde, a sparkling green wine native to Portugal. Dinner is delicious meals prepared from organic vegetables grown on the property but after a few nights in, we organise a group outing in nearby Aljezur with Laurie, David, and Ricardo uno. Pont’A Pe is a charming restaurant by the river with blue-chequered tablecloths. We tell Milton, the restaurant manager and our waiter for the night, that we want a typical Portuguese meal and he serves up a feast: clams steamed in garlic, fresh sardines, barnacles, roasted chicken in piri-piri sauce, sweet potato, sea bass I was asked to pick from the restaurant’s aquarium. Mussels in garlic and white wine sauce, and carne de porco à alentejana, a Portuguese twist on surf and turf – fried pork, potatoes and clams. For dessert Milton brings out a tray of pastries and crème caramel and shots of Medronho, which is also known as Portuguese firewater. After dinner we visit a 10th century Moorish castle, now in ruins, climbing the steep cobblestone path by the light of the full moon to admire the sleeping village of Aljezur with its whitewashed houses and red tiled roofs. Another memorable meal is our farewell dinner. In Australia, BYO – or bring your own – usually refers to a bottle of wine, but David brings his own barnacles to the Taberna do Gabio in Odeceixe. We have creamy sheep’s cheese, anchovy paste, olives, fresh bread, and carne de porco à alentejana. Barnacles are not my favourite Portuguese delicacy – they kind of taste like a chewy squid – but considering David got up at dawn to scrape them from rocky cliffs washed by treacherous waves, I eat as many as I can. At the end of the meal, Selina and I have a final glass of Portuguese firewater, and promise to return to this beautiful part of Portugal with its delicious food, gorgeous beaches, and warm and hospitable people, as soon as we can. Beaches, yoga, surfing and food... sounds like an ideal holiday! Thanks so much for posting and telling us about this wonderful place! This sounds like a fun vacation! I think I'd go for the yoga in the sand, too. Especially at sunrise. What a sight that would be! Absolutely fascinating piece, Heather! I've never heard of this part of Portugal and sleeping in tipis, eating barnacles, and drinking firewater? Sounds a bit like science fiction -- though the beach and yoga sounds divine. Thanks so much for sharing this -- I feel like I just returned from a short trip myself!